KABUL, Afghanistan - Defense Secretary Leon Panetta says the U.S. will continue to conduct intelligence operations like the recent one that led to the loss of a drone over Iran. 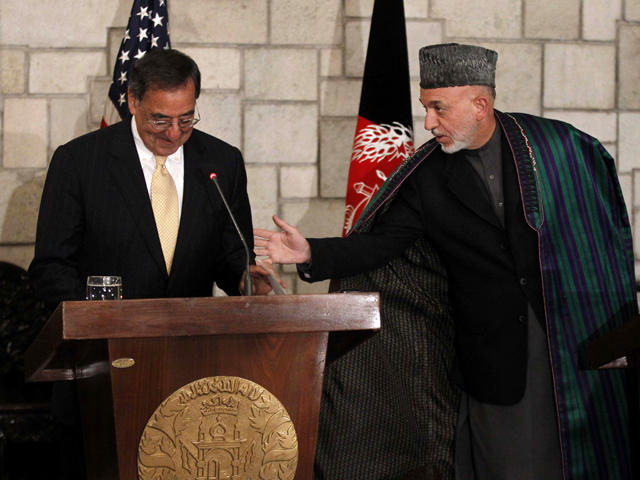 Speaking at a press conference Wednesday with Afghan President Hamid Karzai, Panetta said he would not publicly discuss the secret surveillance missions that the drone incident has highlighted. But he added that part of U.S. efforts to defend both Afghanistan and the U.S. homeland involve what he termed "important intelligence operations which we will continue to pursue." Karzai, meanwhile, says Afghanistan doesn't want to be involved in any "adversarial relations" between the U.S. and Iran. The RQ-170 drone  known as the Sentinel  was lost over Iran two weeks ago. Iranian state television broadcast video of Iranians inspecting the aircraft, which was largely intact.